Bill’s legal practice emphasizes business organizations and transactions, real estate, wills, trusts and estates and trusts administration, and tax and aviation law. Bill is a native of Wichita, and a graduate of Kansas State University (B.S. Accounting 1974) and the University of Kansas (Juris Doctor 1979). Before law school, Bill worked with KPMG Peat, Marwick, CPAs, in Kansas City, Missouri, earning his certificate as a Certified Public Accountant in Kansas. Bill is a member of the Kansas Bar Association, and Wichita Bar Association (past chair, Real Estate, Probate and Law Day Committees). He is a life member of the Kansas Society of Certified Public Accountants and member of the Wichita Estate Planning Council. Bill has spoken on business transactions, tax, estate planning and aviation law topics. Bill participated in the Wichita Chamber of Commerce Leadership 2000 program. Bill previously served on the boards of Wichita Habitat for Humanity and Wichita Community Theatre. He currently serves on the Starkey, Inc. and Wichita Bar Foundation boards. Bill is a volunteer guardian ad litem with The ARC of Sedgwick County, and an adviser to Jayhawk Chapter 88 of the Experimental Aircraft Association. Bill and his wife, Libby, have three daughters. Bill is an instrument-rated private pilot. Kurt Harper practices primarily in the field of business litigation, including employment litigation, construction disputes, real estate matters, warranty claims, and securities fraud. Kurt also serves as a mediator and as an arbitrator, including having served on a number of panels for FINRA. He is a native of Wichita, and attended the University of Kansas, obtaining a bachelor’s degree in Russian Language and Literature (with honors) in 1976, and a Juris Doctor in 1979. He was included in the Order of the Coif for his class. Upon graduation, he returned to Wichita, and has practiced law here continuously since that time, as well as maintaining his proficiency in Russian. 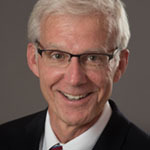 Kurt is a member of the Wichita Bar Association, where he served as secretary-treasurer in 1986-87, and is a member of the Kansas and American Bar Associations. His community involvement includes serving on the Board of Directors for the Wichita Symphony Society for over 30 years, where he has held several offices, including President; and Rotary International, for which he has served terms as club President and Vice President for the Rotary Club of Wichita; the president of the U.S. section of the Russia-US Intercountry Committee; and will serve as the District Governor for Rotary District 5680. He has previously served on the Board for Episcopal Social Services, and on the Vestry for St. James Episcopal Church. In addition to an AV rating from Martindale, Kurt has received other peer recognition, including designation as a Kansas “SuperLawyer” in the field of business litigation since 2006, and as a “Best Lawyer” in commercial litigation since 2007. For 2019, Kurt received a designation as “Lawyer of the Year” for “Bet-the-Company Litigation” from Best Lawyers in America. In the summer of 2008 the nation’s largest and fastest growing midstream crude oil purchaser, SemCrude, declared bankruptcy. SemCrude’s demise was not the result of a bear market—crude oil traded on the NYMEX at $147 per barrel the month SemCrude filed—but of its taste for risky options trading. The bankruptcy pitted the competing liens of thousands of unpaid oil and gas producers and royalty owners who sold their crude oil to SemCrude at the wellhead against those of SemCrude’s lenders and the claims of downstream purchasers. Producers from Texas, Kansas, and Oklahoma claimed prior perfected security interests and statutory liens under various nonuniform state amendments to Article. These were adopted specifically to protect producers from the insolvency of crude oil purchasers. The Bankruptcy Court for the Federal District of Delaware, however, found none of the producers’ lien rights to be perfected under applicable law and awarded priority to SemCrude’s lenders. Producers and royalty owners were left holding the bag. The dust has all but settled since the Third Circuit’s July 2017 decision in In re SemCrude, 864 F.3d 280 (3d Cir. 2017), affirming the Delaware Bankruptcy Court’s ruling and further awarding priority to downstream purchasers of the oil over the producers. Yet little has been written about the decision’s implications for the broader crude oil market. Only Oklahoma has acted to fix the flaw of its statutory lien identified in the litigation. And no one has attempted to reconcile the policy of the Third Circuit’s decision—preservation of the free, unencumbered flow of crude oil in downstream commerce—with the rights and expectations of upstream crude sellers. Crude oil’s path from underground to a gas tank involves many buyers and sellers. Mineral owners own the real property where the oil is originally in place. Because mineral owners generally lack the capital and expertise to extract the oil, they lease the land to specialized firms in exchange for a cost-free royalty, granting the lessee the right to produce and sell the oil. Oil producers contract with third-party purchasers to sell the produced crude. These buyers, called “midstream” companies, arrange for transportation of the oil (usually by pipeline) and sell it to downstream buyers to be refined and eventually retailed to end users. Midstream companies typically make a modest margin on transporting the product. At each step of the way sellers take the product on credit and make payment usually on the twentieth day of the following month. Midstream companies commonly hedge the value of the crude oil in their transportation systems by acquiring put options—the right to sell the oil at a specified price on a future date—to ensure they don’t have to resell the oil for a loss. SemCrude, instead, sold call options giving the buyer the right to purchase oil from SemCrude at a specified price at a future date, essentially betting the price of oil would drop. In re SemCrude, 864 F.3d at 287. In an effort to grow profits quickly SemCrude took an enormous position in these options. As the price of oil kept rising SemCrude kept losing its bets and took additional loans to double down. It eventually buckled under margin calls. When it failed, SemCrude lacked the cash to pay producers for oil it purchased the previous month. Oil producers have endured midstream bankruptcies before. As a consequence, several oil and gas producing states (e.g., Texas, Oklahoma, Kansas, North Dakota, and New Mexico) have laws giving producers a lien in crude sold to the first purchasers to secure payment. Texas and Kansas, for example, include a nonuniform provision in their versions of Article 9 granting producers an automatically perfected purchase money security interest in production. See Tex. Bus. & Com. Code § 9.343; Kan. Stat. Ann. § 84-9-339a. Oklahoma law provides a statutory lien in favor of producers. 52 Okl. St. Ann. § 549.1, et seq. In the SemCrude bankruptcy, producers from these states asserted that liens perfected under their respective nonuniform state laws obtained priority over SemCrude’s lenders and downstream purchasers. The Delaware Bankruptcy Court disagreed. Essentially the court found that under both Texas’s and Kansas’s versions of Article 9 perfection of the nonuniform PMSI was determined by the laws of the states where the debtors (SemCrude and its affiliates) were located—in this case, Oklahoma and Delaware. The drafters of revised Article 9 intend the uniform choice of law provision to eliminate uncertainty about how to perfect and where to file and search for financing statements. Neither Oklahoma nor Delaware adopted the nonuniform PMSI. Thus, the only means of perfecting the producers’ security interests was to file a financing statement in the central filing office of the debtors’ location; none of the producers had done so. As for the producers claiming priority under an Oklahoma statutory lien, the court simply noted the statute expressly subordinated the lien to Article 9 security interests. The Third Circuit affirmed the lower court’s ruling and reasoning. For procedural reasons the appellate panel also held that the producers’ security interests and liens were subordinate to the rights of downstream purchasers of the crude oil that enjoyed status as buyers for value and buyers in the ordinary course. The most striking aspect of the Third Circuit’s opinion is its commentary on the nature of the downstream oil and gas market and the importance of keeping it free from sellers’ encumbrances. “The oil industry operates through sales on credit. . . . The industry thus uses the Conoco warranty that this oil is sold free and clear of any liens because it is a hard-to-trace, liquid asset that flows throughout the country.” Id. at 300. The court continued, “In sum, if any producer of oil tries to sell it subject to a security interest . . . that flows endlessly down the stream of commerce, it will be unsold. The Producers’ contention that a lien . . . follows oil from their wells to the gas pump does not make sense for this type of market.” Id. at 301. On the one hand, producers and royalty owners shouldn’t have to bear the risk of purchasers’ insolvency unsecured. But on the other hand, assuming the Third Circuit’s logic holds, the free flow of oil in the downstream market depends on it being sold on credit unencumbered by liens and security interests. Resolving this dilemma requires addressing the source of the problem—the midstream firm’s insolvency. Crude oil and natural gas transportation companies routinely hedge the value of their crude oil to ensure they recoup their investment in it plus overhead and reasonable profit. But when does routine hedging become SemCrude-style speculation? According to Professor Emeritus Paul MacAvoy, it’s “[w]hen you have a large open short position and not enough physical barrels to cover your short when the contracts expire.” Another way midstream companies like Semcrude can get in trouble is to venture beyond mere futures contracts intended to hedge into call options intended to profit. Dodd-Frank’s Volcker rule prohibits federally insured banks and their affiliates from engaging in proprietary trading and investing in hedge funds to limit the risk of failure of large financial institutions. The rule isn’t without critics both for its drafting and its unintended consequences. Regardless it is the intent of the rule more so than the rule as written that provides a model for regulating midstream crude markets. That intent, according to the rule’s namesake Paul Volcker, is to reduce systemic risk to the financial system by limiting high-risk trading activities by key banking institutions. A federal rule designed to limit high-risk trading by midstream oil and gas firms would reduce the risk of their insolvency. It would thus mitigate the largest risk facing producers of oil and gas in terms of payment for their product. Accordingly, it would reduce the compulsion oil and gas producing states feel to protect producers and royalty owners through nonuniform statutory liens and UCC provisions that might clog the otherwise free flow of oil in downstream commerce. Oklahoma’s reaction to In re SemCrude, for example, has been to patch its statutory lien to prioritize it above Article 9 security interests. Other states are likely to follow suit unless a more efficient solution to systemic risk is found. Wichita has had a rough couple of months when it comes to workplace accidents. It seems like every time the news comes on there is another large-scale workplace accident that has claimed another life. Employers should always look for ways to increase workplace safety. Employees, however, might fear being terminated or retaliated against for reporting workplace safety issues. While it is true that Kansas is an at-will employment state, meaning you can be fired at any time and for any reason as long as it is not discriminatory, the Kansas Supreme Court has carved out a public policy exception to the at-will status of employees. This public policy exception functions as a sort of whistleblower protection. It protects employees who have been fired for reporting a violation of the law if a “reasonably prudent person” could conclude that either a co-worker or an employer was engaged in activities in violation of rules, regulations, or the law pertaining to public health, safety, and the general welfare; the employer knew that the employee reported the violation before being terminated; and the employee was discharged in retaliation for making the report. How would this look in practice? Say, for instance, that you work as a truck driver and you have a set number of hours you are allowed to drive. If your employer is making you drive in excess of those legally permitted hours and endangering the lives of other motorists on the road, what can you do? You can report it to the applicable regulatory agency, which in this instance would be the Department of Transportation. To ensure that you are protected under the public policy exception the employer must know that you reported the violation. If your employer terminates you following the reporting of the violation, then you most likely have a viable case for retaliatory discharge. What are you allowed to recover in a case for retaliatory discharge? Typically, you can recover back pay, front pay, damages for emotional distress, and punitive damages (if the circumstances support it). Another example is the Occupational Safety and Health Administration (OSHA) regulations. These guidelines are put in place to protect worker safety and are often violated in order to save costs. The recent horrific accident in Bel Aire where a 29-year-old man was killed when a trench he was working in collapsed is currently being investigated by OSHA. OSHA requires trench shoring to stabilize the sides of all trenches over five feet deep. The use of trench shoring and other OSHA safety regulations is exactly the type of regulation anticipated by the public policy exception. Reporting the failure to use trench shoring, or some other type of OSHA requirement by employees is a protected act under the public policy exception in Kansas and if you are terminated as a result you could have a viable case for retaliatory discharge. The above examples are not exhaustive. The whistleblower protections apply to the reporting of all violations of rules, regulations, or laws pertaining to public health, safety, and the general welfare. Some other examples are reporting misuse of funds, mishandling chemicals, and failing to comply with licensing requirements. If you believe that you have been retaliated against for reporting a violation of rules, regulations, or the law pertaining to public health, safety, and the general welfare, then you may have a case. Whistleblowers are protected from retaliation in employment in Kansas to the extent that they act in good faith. If your employer is violating the law and endangering your safety, it is always best to consult an attorney. If you fear that your employer will retaliate against you for reporting a workplace safety violation, then you should always ensure that you will be protected before taking any action. This article is based on hypothetical facts and is issued for general informational purposes only. It is not intended to be construed or used as legal advice. Depew Gillen Rathbun & McInteer LC attorney Benjamin Carmichael successfully brought a nuisance claim against an automotive repair shop that had dumped waste oil and solvents on their clients’ property. The plaintiffs alleged that the dumping of waste oil created a substantial and unreasonable interference with the use and enjoyment of their land. The Sedgwick County, Kansas jury returned a verdict for the plaintiff. Judge Eric Commer presided. One of the major breakthroughs that has happened recently in Wichita is that it has become aware of itself. So says Joe Schremmer, a Wichita lawyer who grew up in Derby and one of a dozen WBJ Emerging Leaders who participated in a roundtable discussion on Thursday. Schremmer, who works for Depew Gillen Rathbun & McInteer, said the self-reflection can be depressing at times, but he thinks the awareness will ultimately improve the community. The Kansas Geological Survey, the Great Plains Institute, and the State CO₂-EOR Deployment Working Group recently held an invitation-only workshop to discuss opportunities to capture, transport, store, and utilize CO₂ from industrial sources in Kansas and neighboring states. The meeting included discussions of new revenue opportunities for industry sectors such as ethanol, and for new oil production in Kansas through CO₂ Enhanced Oil Recovery. The meeting included a discussion of current policy initiatives aimed at scaling up carbon capture, storage, and utilization from various sources and the potential for Kansas. Chris Steincamp was one of the expert presenters, and Joe Schremmer was an attendee. Charles C. Steincamp has once again been recognized as Best Lawyers’ 2018 Wichita Environmental Law “Lawyer of the Year”. This is the fourth time he has received this honor. The award is based on the consensus opinion of leading lawyers about the professional abilities of their colleagues within the same geographical area and legal practice area. Paul Good’s practice focuses on general business and business planning, including an active real estate practice. Paul works with businesses to create an organization structure that will help the businesses achieve their goals. He also regularly assists businesses that are “winding up” by walking them through the sale or acquisition process. Paul has represented thousands of businesses in multiple stages. Paul offers his clients practical advice with real time solutions. Paul grew up in the small farm community of Benton, Kansas. He passed all four parts of the CPA examination during law school where he graduated with honors. While in law school, Paul clerked for the Kansas Department of Revenue and Kansas Corporation Commission, which allowed him to gain insight into the practices of these agencies. He still benefits from those experiences and contacts today. Paul has five children and enjoys outdoor activities including golf, fishing and boating.